Henry's Tacos just turned 50, but the San Fernando Valley landmark may not make 51, if problems with their lease aren't resolved. Now a push is on to save the historical business. It's a landmark in the San Fernando Valley. Henry's Tacos has been on the same corner, serving the same menu of tacos and burritos for 50 years. "I've been coming to Henry's for several decades now," said customer Tom Hensley. "I'd say 20 - 30 years." But now, just days after celebrating its 50th anniversary, the owners lease is in jeopardy. "My current lease expires on the 31st of December, and the landlord is not pleased with the fact that I am being considered for historic cultural monument status," said owner Janis Hood. Gaining historic cultural monument status would mean the property owner would be severely restricted in his ability to make changes to the classic 1960's roadside stand architecture. "It"s intact, and almost completely unaltered," says Hood. "It has the original signage which is called Googie signage." 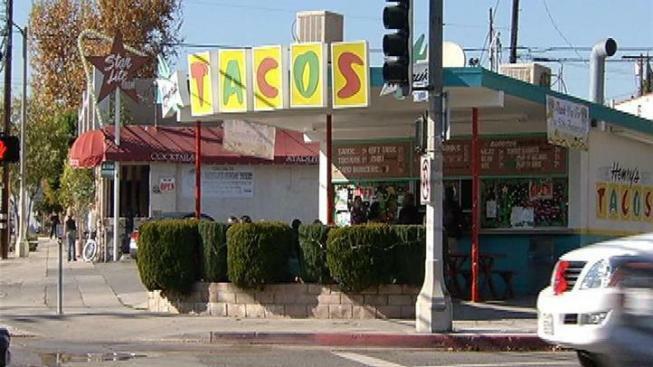 Janis Hood's grandfather opened Henry's Tacos in 1961 on the corner of Tujunga and Moorpark. Now the community is rallying to save it by signing a petition at the stand -- and an online petition has started. There's even a facebook page dedicated to saving Henry's Tacos. "I travel a lot and when I come back to LA, it seems like entire blocks of the valley have been destroyed by developers, every time I come into town," said Hensley. "So I really have come to treasure the places that have stayed the same, and Henry's is one of those."